Getting the right machine for your business is not always about getting something that is super powerful. For many people you just need a solid, consistently performing machine that you can count on. Some of the smaller designs made by our friends at Xerox are still able to pack quite a punch into a relatively small machine. Options like the Xerox WorkCentre 6505 are fantastic for those who need a great machine without a million bells and whistles. The Xerox WorkCentre 6505 is a value-packed option for those who work in small workgroups. It is the right solution for today’s pace of business, because it is the perfect combination of outstanding print quality, unparalleled simplicity and dependability. This machine is made to give you top quality prints without all the hassle. This is the perfect simple color device for single users and small workgroups. The Xerox WorkCentre is here to help you get jobs done without fuss so you can focus on what really matters. Its simplicity, dependability, and ease of management make it the perfect solution for any small business that needs an in-house printing solution. 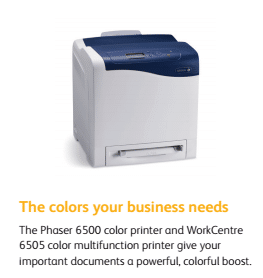 Give us a call today to learn more about the Xerox WorkCentre 6505 for your business.